In the press release for the new SUV, Toyota proudly proclaims, “One could never lose the 2020 Toyota Sequoia TRD Pro in the parking lot of an outdoor gear store.” It makes you wonder if this is something Toyota’s designers and engineers frequently fret about, but it’s nice to know that the company gets me—somebody who definitely does stuff outdoors and doesn’t want to lose my giant truck in the parking lot. 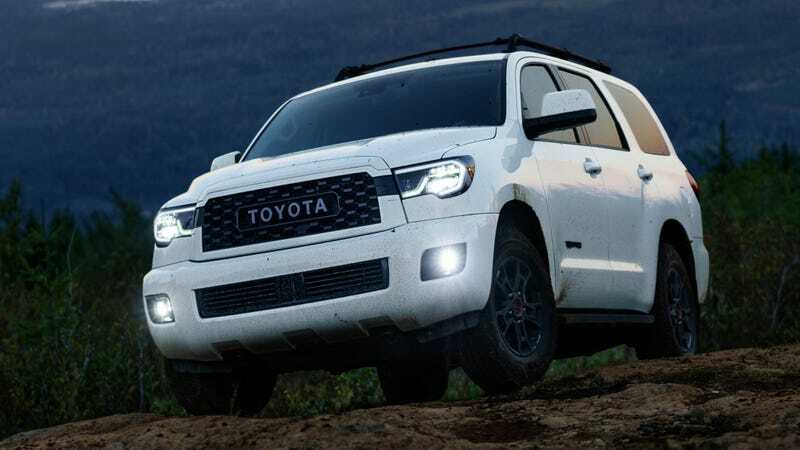 The 2020 Toyota Sequoia is the brand’s fourth model to get the TRD Pro treatment, which gets 2.5-inch Fox shocks in the front with increased rebound travel of 18mm, and 2-inch-diameter Fox piggyback monotube shocks in the rear with bottoming-prevention technology. The 47mm pistons in the rear Fox units are 15mm larger than the standard Sequoia, and the shock rods are 3.2 inches larger in diameter. A 7-inch infotainment touchscreen is now compatible with Android Auto, Apple CarPlay and Amazon Alexa on the Sequoia TRD Pro, and there’s now push-button start. There’s also black TRD seats with red trim, and a three-zone climate control with independent controls in the back, which, as a former child, is nice to have. Black TRD badging is prevalent on the exterior, with the option of army green, midnight black, magnetic gray, or super white paint colors. There’s also aluminum running boards, a roof rack and a TRD front skid plate. A TRD cat-back exhaust with a black chrome tip and, you guess it, another TRD badge, is also available. Otherwise, it’s still a Sequoia with seven seats and a 5.7-liter V8 making 381 horsepower and 401 lb-ft of torque, with a max tow rating of 7,100 pounds, and four-wheel drive with a locking differential and two-speed transfer case. All new Sequoia trims now come standard with Toyota Safety Sense, including Toyota’s pre-collision system with pedestrian detection, automatic braking, lane departure warning, radar cruise control with full stop, automatic high beams, blind spot monitoring and rear cross traffic alert. There was no mention of when the 2020 Sequoia TRD Pro will hit dealers, nor of a price, but the Tundra TRD Pro starts at just shy of $50,000, so expect this to land around there.